My Listing Manager is the built-in lead interface included with your IDX Broker account. This tool lets your website visitors create an account of their own, from which they can save Searches or preferred Properties. Visitors can later return to your site to review their saves and contact details. 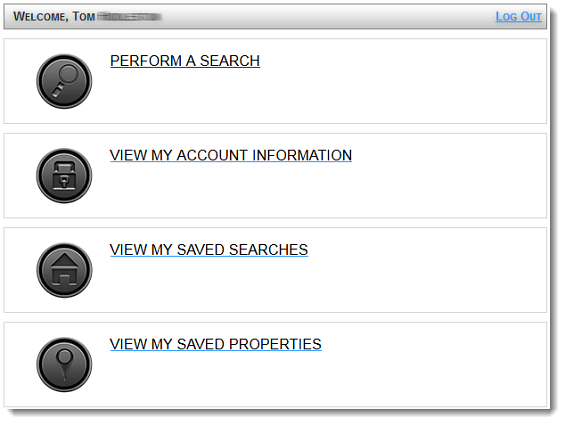 The ability to create a My Listing Manager account by saving Searches and Properties is built into each IDX Results and Details page. There are a few extra links available to you that make it easier for your clients to sign up and log into their new account. These pages are in your IDX Control Panel under the Designs button in the Pages section. Linking to any of these pages will enhance the experience your visitors have while using the IDX tools on your website. User Signup is a page in which the client may enter a First and Last name, email address and other pertinent information. You can decide what information is required by changing your Signup page settings. You can customize this page and add some extra content above the form by adding a Subheader. Your subheaders are found under the Designs button in theSubheaders section. There can be a subheader specifically for this page. This is a very useful page for clients who have already signed up for a My Listing Manager account. When they return to your site they can use this page to log in and review the saved Searches or Properties that they already have, or create new ones. This page can also be customized with a Subheader. The Lead Login Widget does the exact same thing as the User Login page, but can be placed as a small form in your sidebar. See your Widgets section under the Designs button, or this article, for more information. This page will return your client to the main screen of his My Listing Manager account. This link will only work if the client is currently logged in, if not, it will redirect the visitor to the User Login page. The Email Updates Signup page is in your Search Pages section, near the top of the list on the Pages screen. This page does a few things at the same time for your customers. This is essentially a Search page with Step-by-Step instructions for creating and saving a search, as well as creating a login for a new My Listing Manager account. If your visitor completes the two steps in this page, that visitor will have a new MLM account, with a Saved Search, ready to start receiving Email Updates as soon as the email address is verified. Note: It is recommended that before placing these links on your site, you take a look at, and set up, your lead registration rules. These can be found under theLeads button in the Lead Registration Preferences section. You can require registration for use of your website or choose a specific number of properties a customer may view before they must register. When your leads sign into their My Listing Manager account, they will see a special menu where they may access saved searches, saved properties, and edit account information and email preferences. 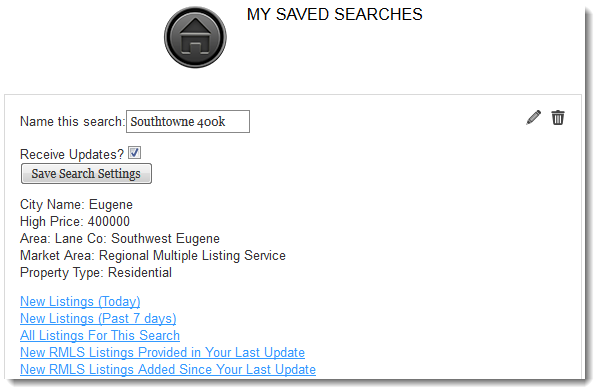 Saved searches and saved properties are stored in separate sections of My Listing Manager. This allows your prospects to find these tools quickly. Simply click on the results links provided for saved searches to view the current day's results, the last 7 days of results, or all the results for this search. By clicking on View My Account Information, your lead may update their contact information, including email address, password, and email update preferences. An additional email address may be added here so that updates may be sent to multiple addresses. If you require the use of a password, the password may be changed here as well. 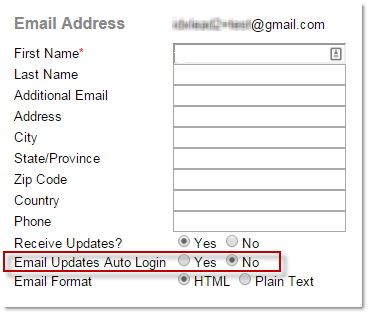 One feature that may save time and frustration on behalf of a visitor is the enabling of Email Update Auto Login. As noted in the previous screenshot, this feature can be enabled within the account information section of My Listing Manager. When enabled, a lead will be able to select a property link from within an email update and bypass the login process. This way they will not have to remember the account name or password every time they wish to view a property. When a lead uses this feature, searches and properties can be viewed, and even saved, but existing information will not be available for editing, until the lead completes the full login. Of course, you may view all information for all of your leads in your Control Panel under the Leads button in Manage Leads.